RECENT successes of Juan de la Cierva’s Autogyro airplane have directed the attention of aeronautical engineers to the possibilities of improving this type of machine into tomorrow’s perfect airplane. The aerodynamics of the autogyro are considerably more complicated than is the case with the conventional type of plane, but various features of its design, such as its ability to descend almost vertically, are most practical. 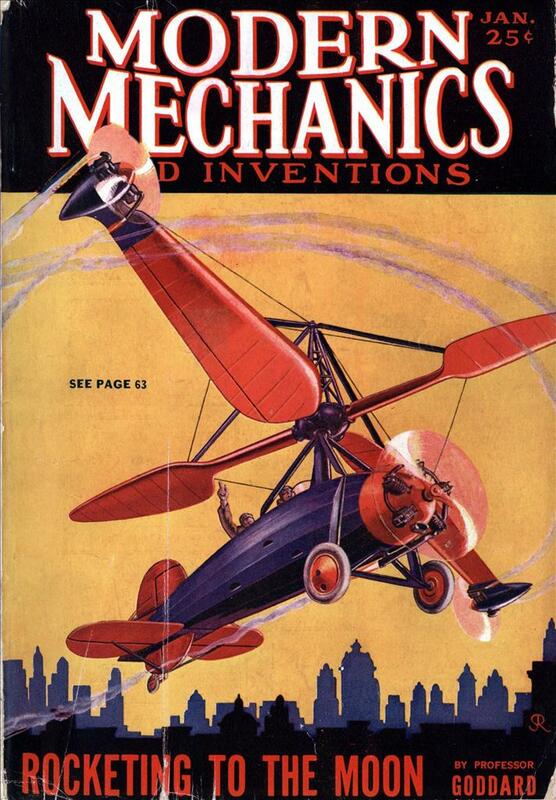 On the cover of this month’s Modern Mechanics, Stewart Rouse has presented an adaptation of the autogyro suggested by a drench designer and tentatively called the helicogyre. The principal difference from the autogyro lies in the installation of two motors in the ends of the revolving wings. In addition to this, the wings themselves are thickened and are generally of heavier construction than the companion pair of wings, without motors, which give fore and aft stability while the motored wings are parallel with the fuselage of the plane. In the autogyro a long run on the ground is necessary in taking off, to give the rotating wings time to gain speed. As implied in the name of the machine, these wings are set in motion automatically when the plane moves forward. In the helicogyre this long take off would be eliminated, the wing motors taking care of accelerating the wings, making possible an ascent which its advocates predict would be almost vertical. The addition of motors to the wings complicates the aerodynamics of the design somewhat. Light, high speed motors must be used to economize on weight. Such installation, however, entirely changes the principle by which flight is attained. The two small wings, resembling the lower wings of a biplane, are used more for directional control than for lifting power. Practically all of the lift is supplied by the revolving wings. An extremely low landing speed is a feature of the autogyro which appeals most strongly to observers. The plane seems almost to hover in the air, and when it comes down in a vertical line it stops rolling almost at the instant its wheels touch the ground. If the autogyro’s take-off ability can be made comparable to that of landing, the machine will have an ability to land in and rise from a back yard. They never used piston engines on the rotor tips, but pressure jets and ramjets were used successfully except that there was a noise problem with some birds. KH: Fairey Rotodyne comes to mind. This concept was taken to the extreme in the early 2000s. A company (I forget the name) proposed a space capsule that would do a controlled reentry by deploying… a helicopter rotor with tangential rocket engines! As mentioned in the wikipedia article, the Soviets also apparently considered rotor landings much earlier. This is actually closest to the design of the disastrous Isacco I-4. The link I have given leads to an article about it. 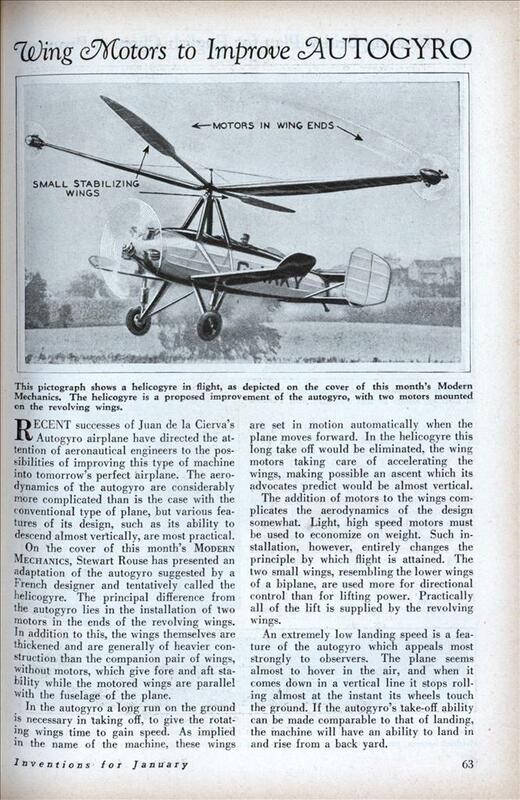 In those days you had to start a piston engine by spinning the propellor. On an ordinary aircraft, you first put chocks under the wheels to stop it coming forward and chopping off your head. On a helicopter with piston engines at the blade tips, you have to climb up a ladder and then jump off when the blades start turning. Then, when the blade does start turning, the engine at the tip is subject to tremendous centrifugal force, which in the case of Isacco’s machine tears it right off. With simple ramjets at the tip, this can be made to work; with complicated piston engines, it is a really terrible idea. A lot of research was done with Rotary Rockets (ROR) Here is a film from the 50’s.